F-tone's QSFP-40GM-LR4 QSFP+ transceiver modules are designed for use in 40 Gigabit Ethernet links and 4x10G OTN client interfaces over single mode fiber. They are compliant with the QSFP+ MSA and IEEE 802.3ba 40GBASE-LR4 and OTU3 C4S1-2D1 requirements specified in ITU-T Recommendation G.695. Digital diagnostics functions are available via an I2C interface, as specified by the QSFP+ MSA. The transceiver is RoHS-6 compliant and lead-free per Directive 2002/95/EC, and F-tone Application Note AN-2038. F-tone 40GBASE-LR4 QSFP Module supports link lengths of up to 10km over a standard pair of G.652 single-mode fiber with duplex LC connectors. The 40Gbps QSFP+ transceiver is well suited for Infiniband and 40GBASE-LR4 applications. It combines the higher density attractions of parallel modules with some of the key advantages normally associated with SFP+ based modules. 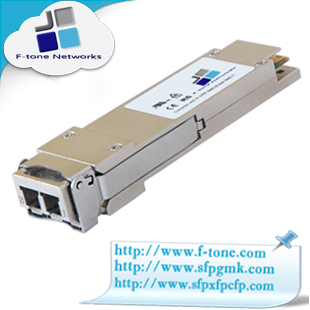 F-tone’s QSFP28-100G-SR4 module is a 4-channel transceiver capable of transmitting and receiving 100 Gbps simultaneously. F-tone’s QSFP28-100G-SR4 transceiver performs at high speeds while consuming extremely low power—allowing for > 50% reduction in power consumption compared to 4 SFP+ inF-tonerconnects. F-tone 40GBASE-SR4 QSFP Module supports link lengths of 100m and 150m, respectively, on laser-optimized OM3 and OM4 multimode fibers. It primarily enables high-bandwidth 40G optical links over 12-fiber parallel fiber terminated with MPO/MTP multifiber connectors. It can also be used in a 4x10G mode for interoperability with 10GBASE-SR interfaces up to 100m and 150m on OM3 and OM4 fibers, respectively. QSFP/QSFP+ Passive Electrical Loopback FTCQ-XLB is used for testing QSFP/QSFP+ transceiver ports in board level test. The electrical loopback provides a cost effective low loss method for QSFP/QSFP+ port testing. The FTCQ-XLB is packaged in a standard MSA housing compatible with all QSFP/QSFP+ ports. QSFP/QSFP+ Passive Electrical Loopback is used for testing QSFP/QSFP+ transceiver ports in board level test. The electrical loopback provides a cost effective low loss method for QSFP/QSFP+ port testing. The loopback is packaged in a standard MSA housing compatible with all QSFP/QSFP+ ports. Transmit data from the host is electrically routed, (internal to the loopback module), to the receive data outputs and back to the host. F-tone QSFP+ (Quad Small Form-factor Pluggable Plus) is a new Multi-Source Agreement (MSA) for high speed application, such as 40G-BASE, which provide four channels of data in one pluggable interface. Each channel is capable of transferring data at 10Gbps and supports a total of 40Gbps.